I would like to introduce to you the Milly Apron. This is the prettiest apron out of my entire apron collection. It is sweet and pretty. This apron was inspired by my Grandma Lucas. Her name was Mildred and she always wore an apron. She was a very special lady. Very sweet, patient, loving and very pretty. 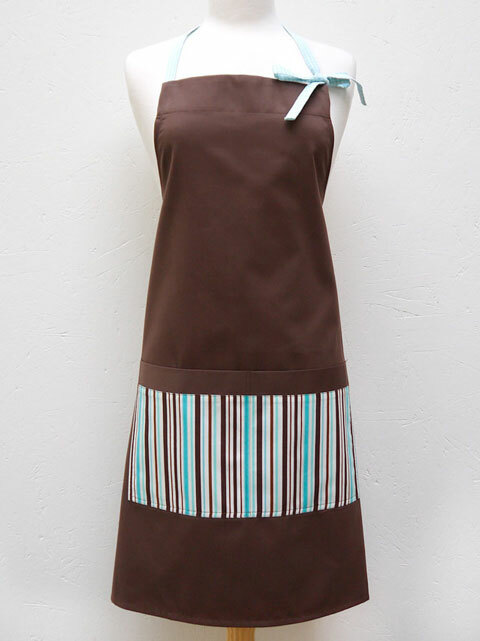 When designing this apron, I had my Grandma in my mind and in my heart. With this apron, I wanted to portray sweet and pretty…which she was. The curved hemline adds an element of sweetness. And I love using bold floral patterns for the main fabric. That’s what makes the apron so pretty. Sweet and pretty. The pocket is gathered at the opening. This little detail adds another element of sweetness. As well, I positioned the pocket on a perfect angle. By doing this the pocket can actually be used. I try my very best to make my aprons comfortable to wear. And this pocket really is at the perfect angle. And don’t you just love that bow? 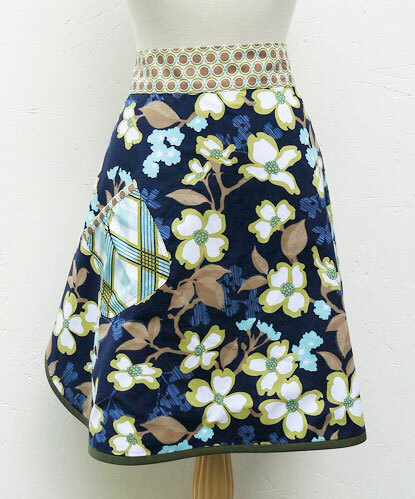 The waistband and bow is in a coordinating fabric and it really finishes off the apron. So there you have it. The Milly Apron. She’s a beauty! If you are interested in a custom Milly apron, please feel free to contact me through my contact page. Here are pictures of the first sample I made of the Milly. Here’s a little inspirational quote by Julia Child. Wishing you all a wonderful weekend. A weekend filled with friends, family, laughter, and good food. The holiday season has officially begun. Ta-Daaaa! This is a great time of year. We get to enjoy the company of friends and family. We get to enjoy all the delicious foods of this harvest season. What isn’t there to love? I suppose the downside is the busy-ness of the holidays. It is a busy time, and it goes by so fast. Every year I think I’m ready for “it”. I’m prepared and buckled in to enjoy every moment of Thanksgiving, Hallowe’en, Christmas, and New Years. Instead of freaking out that I have not bought my turkey, I have not decided which vegetables we are going to have, or when I’m going to have time to make my pie shell (which happens to be gluten-free and is very tricky to make)…I need to take a deep breath. Perhaps a few. Let’s all just take a deep breath. I’m not going to worry about dinner. I’m throwing the whole turkey idea out the window, and I’m going with a simple Rainbow Trout. I would rather relax and spend time with my loved ones rather than sweating it out with Mr. Gobble Gobble. And I am okay with this. OH…there will be apple pie. And of course I will be wearing my apron. The apple pie I am making is from the Butter Baked Goods cookbook. And this weekend I’m trying it out for the first time. I’ll let you know how it goes. Butter Baked Goods cookbook is incredible and I highly recommend it. It is a beautiful book to look through. The pictures are styled so beautifully and the baked goods are mouth-watering. I actually happen to really love reading cookbooks. I read them like a novel. They are one of my favourite things to read. 1. I am grateful for my chilly, but refreshing brisk morning walk. 2. I am grateful for having the opportunity to have my own business, which I love. 3. I am grateful for my family, and friends. 4. I am grateful for my customers, which I have enjoy meeting and serving over the last 7 years. 5. I am grateful for my freedom in this amazing beautiful country of mine, Canada! There is so much more I am grateful for, but I like to write about them in my journal every night before shut eye. Do you have a little nook of inspiration? Perhaps in your home, studio, or office? I am working on something that will be launching tomorrow. I can’t wait to unveil the secret! But before getting to work, I thought I’d take a moment for a little inspiration. This is what I have on the corner of my desk, right next to my computer monitor. It is a collection of things that I love, which really inspires me. The flowers are hydrangeas and roses. I love having flowers on my desk. It makes my work station feel more inviting, cosier, and romantic. The bell is a big favourite of mine, especially since it was given to me by dear friends of mine. When I get a really good idea, I will proudly ring my bell. My bell makes me smile and it adds a little fun to my day. 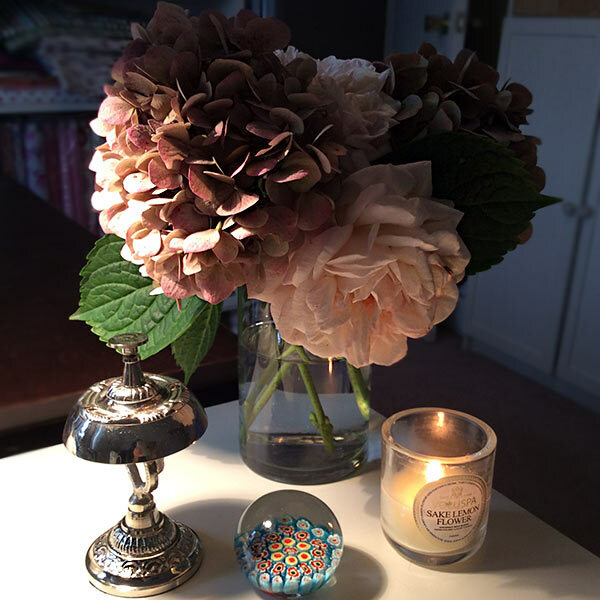 Lighting a candle to add a sweet scent in the air is also another lovely idea. It creates a very inviting atmosphere which helps me to work longer hours….gladly and happily. The paper weight I just love. The colours are bright and cheerful. So If you don’t already have one, I hope I’ve inspired you to create one for yourself. I absolutely love tea time. I have this vintage guide for hosting dinner parties called “Glamour and the Hostess”. I’m not sure how old it is, but it is certainly amusing to read. At the back of the book, there are a series of questions regarding hostessing. Here’s one I just had to share, since I love tea time! I just think this is so funny and charming at the same time. How would one go about asking friends to pour the tea? And how long is a “short time”? Tea time is the best time. I could drink tea all day. I have a collection of teacups and I own an adorable Brown Betty teapot. My favourite teas are black teas, and I do very much enjoy green tea, especially Sencha green tea. 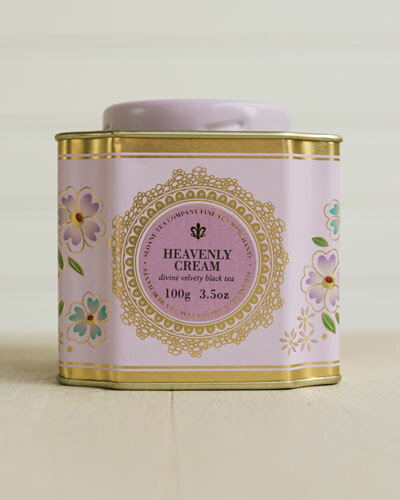 I love Buckingham Palace (which I just recently picked up from Pippins in the Toronto Beaches), Sencha Green Tea, and I absolutely LOVE Heavenly Cream by Sloane Tea. It is so dreamy. I usually add milk to my tea, but Heavenly Cream’s comforting creamy taste requires no milk. As the designer of Crumb Designs, I designed an pretty apron which I like to call the “tea apron”, also known as the Milly Apron. It’s pretty and sweet and would be perfect for a tea party. 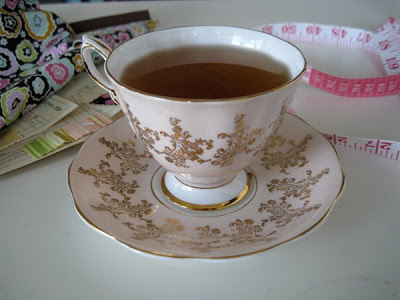 I think it’s time to host a tea party, complete with vintage tea cups, brown betties, soothing tea blends, English watercress tea sandwiches, cookies, and of course the Milly apron. Does your apron coordinate with your kitchen colours? Have you ever purchased an apron to specifically match your kitchen decor? 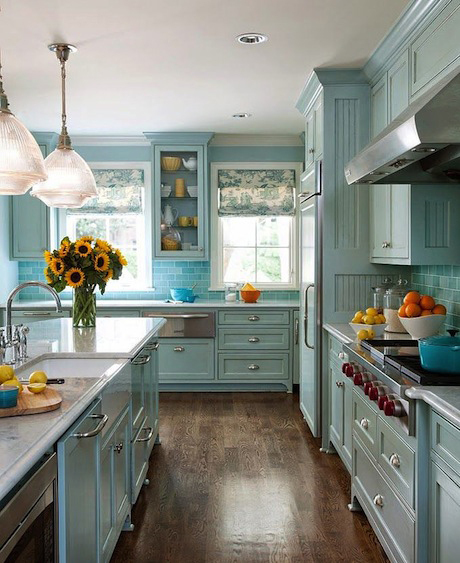 I have had a number of customers admit that they do like to have their apron match their kitchen. And why not? I think that’s fun and totally inspiring. Today I’m featuring one of my favourite Crumb Designs apron that would match perfectly with a very stylish turquoise blue kitchen. I could totally see myself cooking and entertaining in this kitchen wearing my Audrey Apron.